That is the stupidest argument ive ever heard. This is about creating fun events and missions, rather than boring grindfests. Its fully possible to make the mission fun, while still keeping it difficult. It's Do-Able but question is it is worth the potential reward? I'd personally rather just pay a few pounds and open a container which I've already done and I'm not grinding for hours a day for an unknown reward. i dont like this because its probably just there to increase the "viability" of the shop price for those containers. 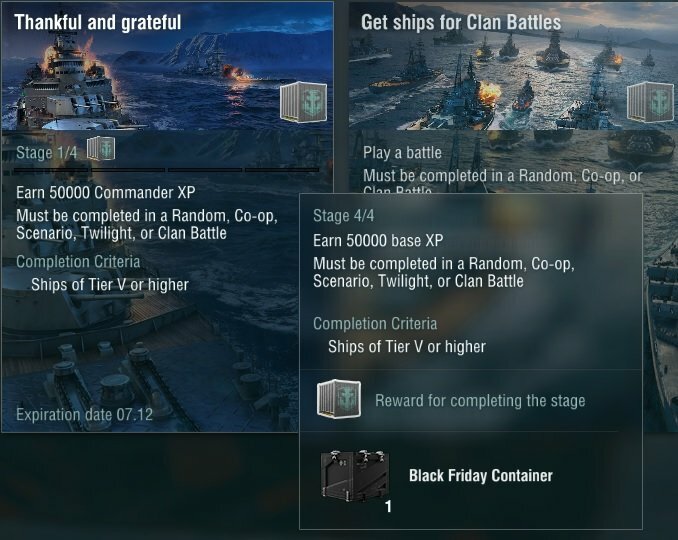 Considering it's possible to get tier VIII premium ships out of those crates and the individual mission stages aren't timegated, I find the 50k to be a bit steep personally if I were to look at it from the average joe perspective, but for once not completely out of proportion like the otherwise infamous EU mission requirements of old. At least here you aren't jumping through those hoops for 5 Equal Speed Charlie Londons (though obviously getting a premium ship still requires a lot of luck). Two weeks time seems about an appropriate timeframe aswell considering the first three stages can be done in a jiffy if you stack enough camouflages/signal flags. Plus clan battles actually count aswell, that's a yay. Considering it's possible tog et tier VIII premium ships out of those crates and the individual mission stages aren't timegated, I find the 50k to be a bit steep personally, but for once not completely out of proportion like the otherwise infamous EU mission requirements of old. The other thing though Ao, is you get three of the containers just for logging in for ten out of the fourteen days the mission is active (daily login stuff just like Halloween) the mission chain is five total containers. For significantly more effort, it just doesn't stack up. The first three stages are fine, but then having an equal amount of base xp (the one that is hardest to get as it relies on winning and doing well a lot and can't be modified) is just too much compared to how little effort the rest of the chain is as well. Just see them as heavy grinds for small batches of camos. Could be worse... could be a cosmetic flag of the "Free French" which you'd get a week later for playing 1 battle. Still too much to ask for imo then. I've just given up on Wargaming and the game at this point tbh. Actually I checked and if the news article pictures are following the same logic as with previous containers, then they aren't the same, i.e. : lowered ship drop chances for non-premium shop containers. No. Containers are not the same and chance to get those ships from standard black containers are slim. Every complaint I have ever made is only ever because I want the game to be better. I would still love to care, I'm just burnt out on every piece of feedback being ignored by Wargaming. Always.